Tahitian single-outrigger canoe used for interisland travel, for fishing, to visit around the lagoon. Early boats accompanied warring parties, pro-viding transportation and carrying the dead home. Plank-extended dugout hull, sometimes in sections, sewn end-to-end; rounded bottom; truncated stern swept up strongly. Sharp, concave cutwater; squared coverboard extended beyond the bow cutwater, often with low washboard at after end; sometimes hull raised by washstrakes. Long, slender float on port side of hull connected by 2 booms. Foreboom horizontal and attached to the float by 2 pairs of crossed stan¬chions; the flexible stern boom curved down and lashed directly to the float. 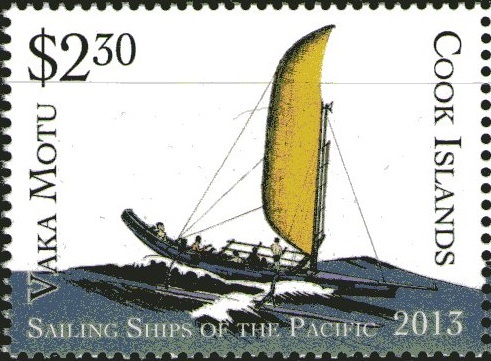 Va'a initiative was designed to take the wind on both sides , with the balance of the platform , where some of the crew can add weight as necessary to prevent the float from a submerged followed the disaster. A balance board generally extended out the outrigger side as well as the starboard side. When the canoe capsized, a rope was tied to the end of the boom and one of the crew climbed onto the beam to make it sink while pulling on the rope until the sail lifted out of the water,which, with the help of wind, righted the canoe. Stepped 1, occasionally 2, portable pole masts in forward half; stayed forward, to outrigger boom, and to the balance board. So-called "crab claw" sail of pandanus leaves had a long boom that curved up to run parallel to and beyond the mast. Frequently paddled. 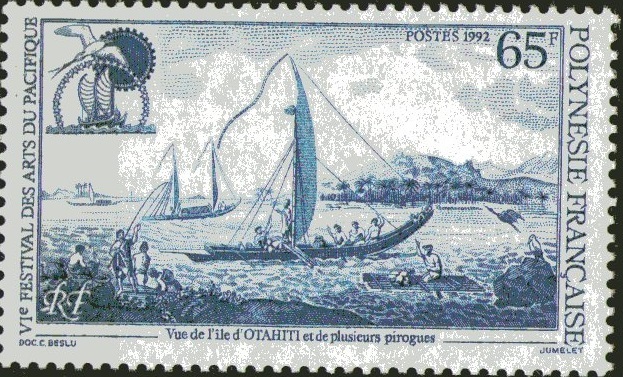 French Polynesia 1992; 65f; SG654. 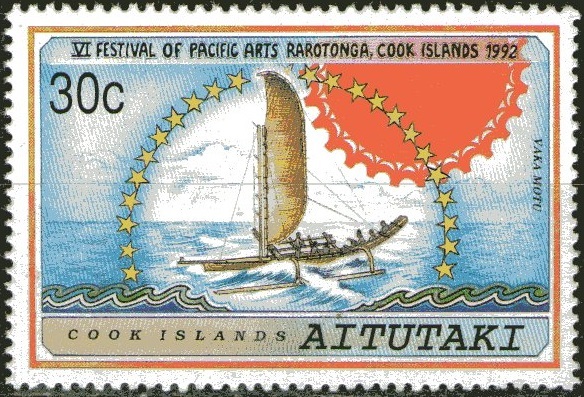 Aitutaki 1992г,30с,SG632. 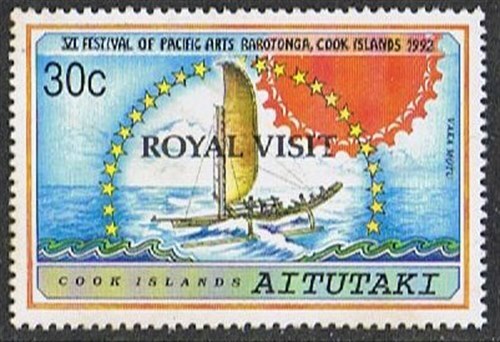 Cook Islands 2013; 2,30;60c;SG? Source : A Dictionary of the world’s Watercraft from Aak to Zumbra. 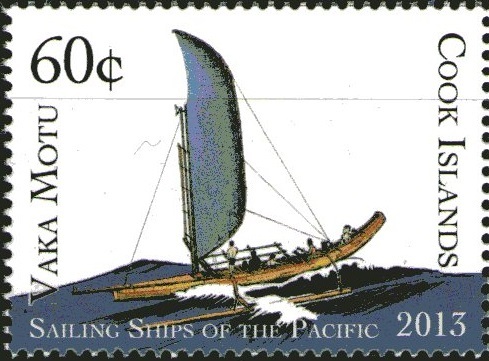 W.Ellis:Polinesian Researches. http://www.britishmuseum.